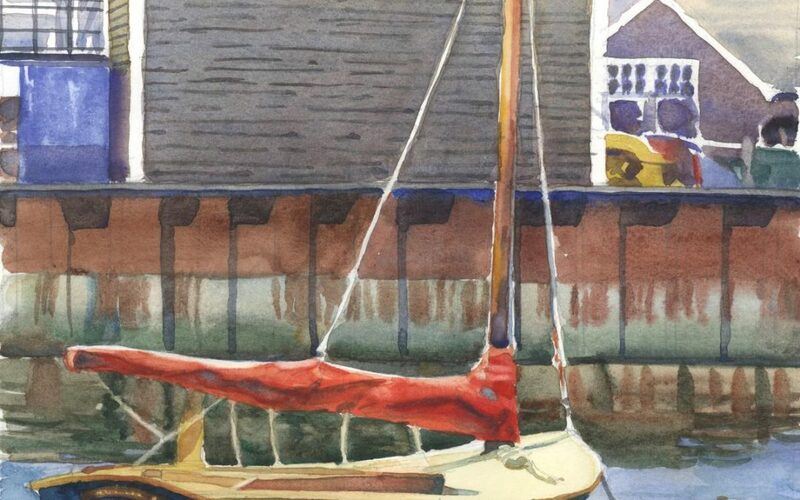 Boat scenes are so numerous on Nantucket, that even artists find it difficult to isolate a subject with a fresh eye. 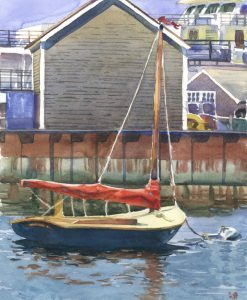 The vibrant juxtaposition of this single sailboat with orange sail against the weathered gray building and rusted pilings, with an island ferry looming behind, was the striking subject for this piece. The play of strong verticals – the mast, the sea wall, the white building trim, the subtle reflection – were contrasted by the primary horizontal of the sail, the shingles, and ferry railings. It became a layered vignette with much to tell about Nantucket. ORIGINAL NOW AVAILABLE.